By TruePublica: The reality of Britain’s no-deal exit from the European Union is now dawning upon us all – both Leavers and remainers. From what we are being told by the experts, a hard-Brexit is going to be truly painful economically. The government is preparing for much worse though. Ian Dunt, editor at Politics.co.uk says it all in a few words – with less than 50 days left to the 29th March. His frustration is palpable – “It is hard to fully describe the contempt felt towards May in Brussels right now. Just imagine sitting across a table from someone for two years and having them tell you that this is the plan they need, this is the plan they can get through the Commons, and then watch them delay a vote on it, lose catastrophically, whip their own MPs to vote against it, and then come back, cap in hand, asking for you to change the thing that they themselves proposed you must do. The shame of it. The sheer inadequacy. Even Britain’s application to join the WTO was rejected by the very WTO members that the Brexiteers like Liam Fox keep telling us will be our new global trading partners. Eleven countries rejected the British application including America because they want even more deregulation and extreme free-market access than you can imagine. And so, Britain is now preparing for the very worst. Thousands of army personnel and thousands more reservists are being put on standby. Police forces across the nation are making preparations. The domestic security service MI5 now has 20 per cent of its entire staff posted to trouble hot-spots and even the Royal family are preparing to move in case of protests and riots. Now we hear that the government has started to recruit civilians to work in an emergency command and control centre being set up to try to make sure Britain runs smoothly in the aftermath of a potential no-deal Brexit. The government is mobilising all of its resources with the chief executive of the civil service, John Manzoni, already confirming it is looking to second 5,000 civil servants, with volunteers sought in non-Brexit departments including the Department for Education and the Department for International Development. According to briefing notes seen by the Guardian, “candidates are being offered between £300 and £400 a day and must be prepared to start by the end of this month. The Guardian also reports that this emergency control centre will have a full team of officers “checking the “battle rhythm” for emerging urgent policy changes.” One assumes they mean by battle rhythm – they mean trouble on the streets, not the causes of it. Don’t forget, it was the Tory coalition government who oversaw the 2011 England riots, more widely known as the London Riots. 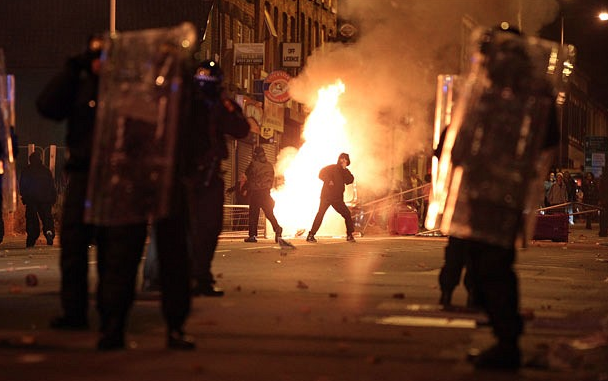 This was a series of riots in August 2011 when tens of thousands of people rioted in 14 London boroughs and then 14 cities and towns across England, which saw looting, arson, and mass deployment of police, and then the deaths of five people. There were 3,000 arrests and 1,000 criminal charges, nearly 3,500 acts of criminality were recorded that caused £200 million of property damage. Detailed studies concluded that racial tension, class tension, economic decline and the unemployment that the recession from 2008 had brought were its root causes. Given what the Bank of England and many economic experts have said – we can expect worse. This is what they mean by ‘battle rhythm’. Issues at stake are not just about civil unrest. Water quality issues may emerge if there is a shortage of purification chemicals. Defra’s leaked documents confirmed plans to deal with “putrefying stockpiles” of uncollected waste. Health secretary Matt Hancock refused to rule out that medicine shortages could lead to deaths under no-deal. This is exactly how civil unrest starts, which then becomes uncontrollable. In France, the Macron government increased petrol taxes – and boom – up went Paris. Those protests are now getting violent and is now heading for its 14th successive week. Tanks in the capital have arrived. The 2008 Greek riots were sparked by the death of a 15-year-old at the hands of the police. Widespread rioting was unleashed and 70 cities around the world exploded in solidarity. The Spanish riots in 2017 were over the constitution. The spark in Britain could be literally anything. Then there’s the issue of livestock caught in potential gridlock in Kent amongst other important goods that civil society depends upon. Shortages in the shops are expected. Of what – will not be apparent until they become obvious and someone wants it from you. Apparently, applicants in this new ‘command centre are being recruited on a six-month contract with an option of extensions up to two years. “The EUXE centre is designed to be a temporary measure and the authority expects its lifetime to last about six months, with a potential for further extensions in three-month periods, should an ongoing need arise, potentially up to two years,” said the job description.